The Leader of Bath & North East Somerset Council, Cllr Tim Warren, has today shown Bath’s new MP, Ben Howlett, around the site of the planned Archway Centre. The Council plans to create a state-of-the-art Roman Baths Learning Centre above the former city laundry in Swallow Street and a World Heritage Visitor Centre in 10 York Street. 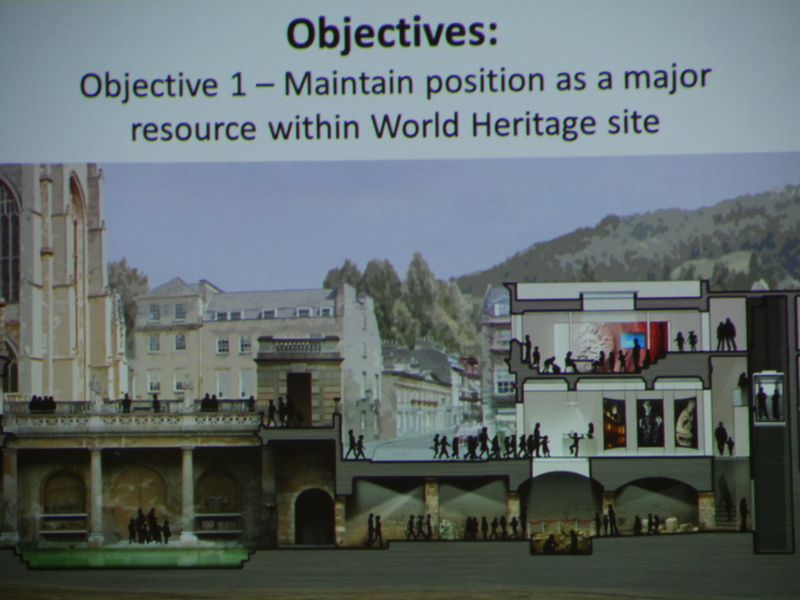 · The World Heritage Centre will be the first dedicated facility in the city centre to explain to residents and visitors alike just why Bath is a World Heritage Site, encouraging them to explore its many important features. 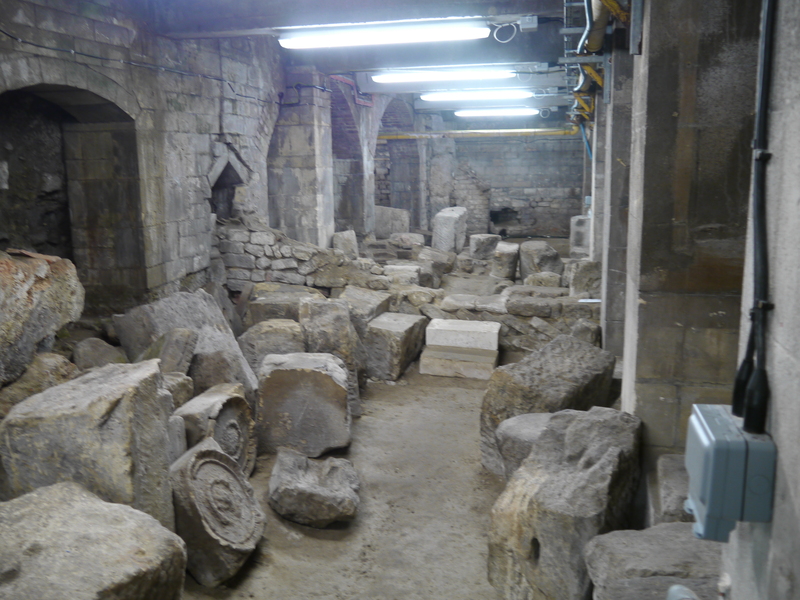 · The Learning Centre will greatly improve educational facilities at the Roman Baths, enabling a wider programme of learning activities to take place, for schools and learning groups of all ages. 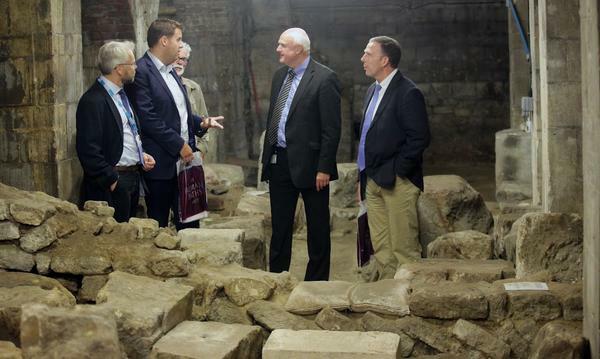 The project will also enable Roman Baths visitors to walk through spaces beneath York Street excavated in the 1880s by City Architect, Major C.E. Davies, and see parts of the site never previously open to regular public access. Cllr Tim Warren (Conservative, Mendip) Leader of the Council, said: “The city’s new MP, Ben Howlett, wanted to see for himself the site of this exciting project. I was able to share with him our vision to help bring to life our heritage. The illustration shows the proposed Archway Centre. Click on images to enlarge. The Council submitted a successful round one development grant application* to the Heritage Lottery Fund (HLF) for £168,100 in 2014. In June, residents and community representatives were invited to share their ideas for the proposed new Archway Centre. Council staff are now working with the design team to prepare a round two application to the HLF early in 2016 for capital funding for the project. Roman monumental stones ‘scattered’ on the floor. An area the public would get to see. Local architects Feilden Clegg Bradley Studios (FCBS) have been appointed lead designers for the planned ‘Archway Centre’. Other members of the design team are Bath-based structural and civil engineers Integral Engineering Design and mechanical and electrical engineers Method Consulting from Swindon. 1. * Heritage Grants (HG) applications are assessed in two rounds. A first-round pass is given when HLF has endorsed outline proposals and earmarked funding. A first-round pass may also include an immediate award to fund the development of the project. Detailed proposals are then considered by HLF at second-round and as long as plans have progressed satisfactorily and according to the original proposal, an award for the project is confirmed. 2. From the archaeology under our feet to the historic parks and buildings we love, from precious memories and collections to rare wildlife, we use National Lottery players’ money to help people across the UK explore, enjoy and protect the heritage they care about. http://www.hlf.org.uk.